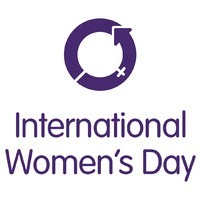 For International Women’s Day and the Press for Progress theme, our authors are writing about movement towards gender parity. Here Eleanor Limprecht looks back at what’s come before, with the challenges and opportunities faced by women during the war. 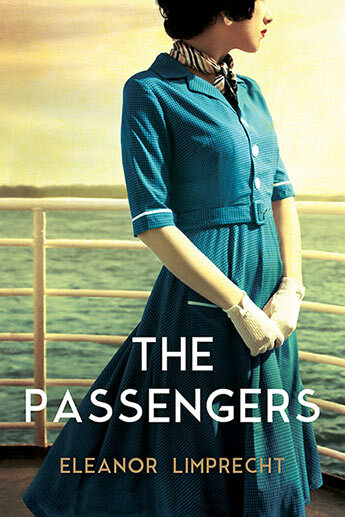 Inspired by research including conversations with the daughter of an Australian nurse and war bride, my new novel, The Passengers, tells the story of Sarah, a young woman who marries an American GI and moves to the United States at the end of 1945. Like Sarah, as many as 15,000 Australian women married Americans and embarked on the adventure of a lifetime when they were given free passage to the US on ships known as ‘bride ships’. In 1945, the US government passed The War Brides Act, waiving all visa and immigration requirements for the foreign brides of American servicemen. 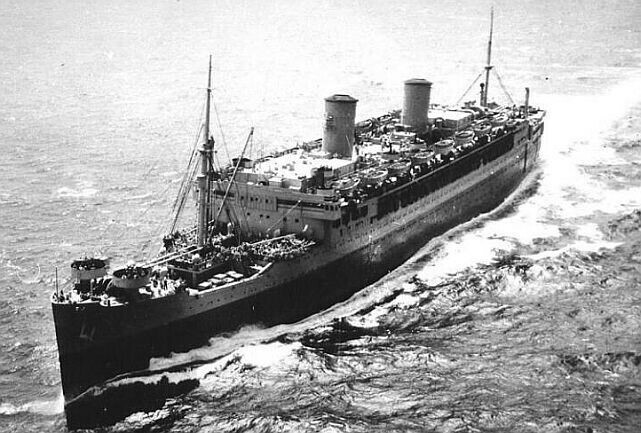 This led to an influx of war brides into the US from all over the world. Women who were engaged to US servicemen were also given free passage on payment of a $500 bond by their American fiancés to cover the return trip should the marriage not take place within three months of arrival in the US. World War II brought with it not only great upheaval, but also independence for Australian women. Because so many men had joined the war effort, women were needed in the workforce for what was previously regarded as men’s work. 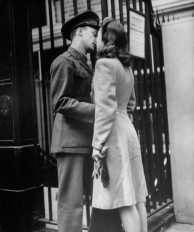 When Australian cities were overrun by American soldiers during the War in the Pacific (up to one million US soldiers were stationed in Australia from 1942 to 1945), frequent dances and social events were held by the Red Cross, with Australian women encouraged to welcome the soldiers and make them feel at home. The charming Americans liked to flatter, were paid more than their Australian counterparts, and they had access to special commissary items like chocolates, nylons and cigarettes (hence the memorable phrase ‘overpaid, oversexed and over here’). They taught their Australian girlfriends dances like the jitterbug and the jersey bounce. Women enjoyed their new-found freedom and many relationships blossomed. Life was fragile, men were dying overseas, and young people grasped what happiness they could. But it wasn’t all romance. The war brides were used to the independence they had during the war. After travelling vast distances to their new homes, they frequently had to live with their in-laws because of post-war housing shortages. While these young women were familiar with the world of Hollywood films, the reality of life in the US was very different from life portrayed on the cinema screen. Some brides went to live on farms in Kansas with no running water, or lived through brutally cold winters in crowded New York apartments with extended family. They were not allowed to work for twelve months while they waited to become American citizens, and on gaining those rights they had to give up Australian citizenship. By that time, they often couldn’t take up paid employment as they were expected to look after their new families. Also, their Australian qualifications for roles such as nursing were unrecognised in the US. The post-war years saw a backlash against the freedoms women in the workforce had enjoyed. 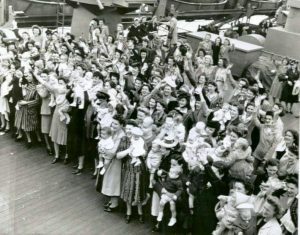 War brides experienced the additional challenges of speaking differently, being without close networks, and their unfamiliarity with American customs. Many war veterans were dealing with the shattering after-effects of the war—post traumatic stress disorder (PTSD) was not acknowledged at that time—and alcohol was a socially acceptable means of suppressing the trauma they had been through. War brides wanting to return to Australia when their marriages fell apart had to pay their own way, a huge burden for women not permitted to work who were living as outsiders in their communities. On International Women’s Day, it is fitting to reflect on the lives and stories of our mothers and grandmothers, women just like those war brides—women we didn’t learn about in history classes at school. Some of those intrepid, brave war brides are still alive and in their nineties now. Their path was not an easy one. It is time we celebrated them and recognised the sacrifices they made. 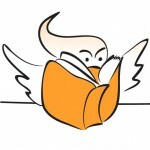 Eleanor Limprecht is a writer, constant reader, writing teacher, critic and mother-of-two. She was born and raised in the US, Germany and Pakistan but now lives in Sydney, Australia. Her previous novels What Was Left and Long Bay, were both published to critical acclaim, while The Passengers was published this month.